Pearls of Australia is thrilled to congratulate the final award recipient of the 2018 Australian Pearl Jewellery Design Masters for People’s Choice. 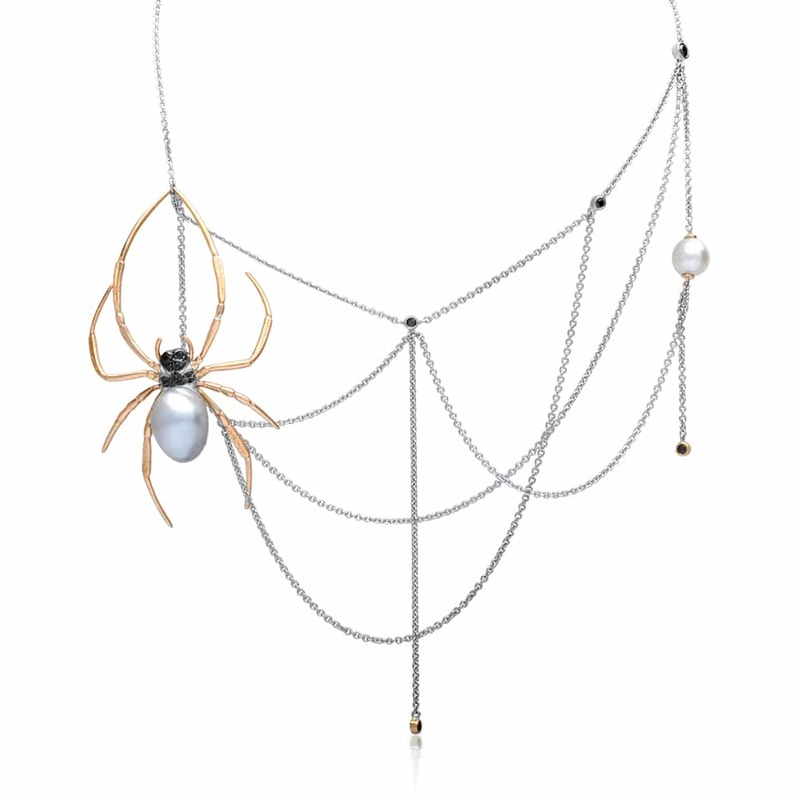 Richelle Perks of Brisbane received the most votes across the three-month campaign for her spider necklace design “Nephila Lucilia”, this announcement follows her Design Master Award, achieving the highest score across an industry judging panel for the same design. Featuring an Australian South Sea Pearl from Cygnet Bay Pearls, “Nephila Lucilia” (scientific name for Golden Orb Weaver) was made in the image of the spiders that surround the Cygnet Bay Pearl Farm with a green bottlefly clasp – the spider itself a detachable brooch. As award recipient for People’s Choice, Richelle will receive an additional $2,000 cash as well as a $500 Pallion Voucher and an Australian South Sea Pearl from Cygnet Bay worth $1,325 – her overall winning prize pool worth almost $13,000. Highly commended in second place is Hannah Alexander with her unique earrings “Ocean Ivy” featuring Australian Blue Sapphires and a Cygnet Bay Australian South Sea Keshi pearl. Voting for the People’s Choice Award opened at the International Jewellery Fair in Sydney on Saturday 25 August and closed on Friday 23 November. Votes were received online and in-person across this period, where the general public were offered an opportunity to vote for their favourite design to win a seat on the 2019 Pearls of Australia East to West Voyage or jewellery prizes, winning voters have been notified. Receiving a record 60 entries of extremely high calibre, this year’s Australian Pearl Jewellery Design Masters have received $30,000 worth of prizes including cash and pearls from Pearls of Australia, Pallion vouchers and memberships at Jewellery Training Solutions. The designs have recently wrapped a national exhibition starting at the Shinju Matsuri Festival in Broome and Cygnet Bay Pearl Farm Harvest Festival before flying across Australia with Pallion, the largest precious metals services group in Australasia. Jewellers from around the world are invited to express their interest in applying for the next Australian Pearl Jewellery Design Masters via the new portal website, www.pearlsofaustralia.com.au. Pearls of Australia invites the world to immerse themselves in the natural beauty of the Australian pearl.